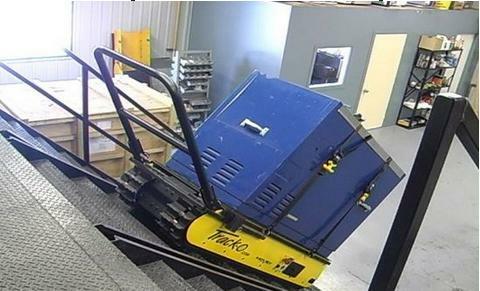 Track-O Stair Climber Truck (Twin Track-47) - TrackOLift TT6611 is a unique material handling device with unlimited applications that built for moving heavy equipment on stairs such as pool tables, pianos and vending machines and also a great motorized hand truck for industrial material handling. The Track-O is the simple to operate, rugged, and versatile solution to moving heaving objects up and down stairs or outside on any terrain. The Track-O moves as a result of the friction between the rubber strap and the ground. 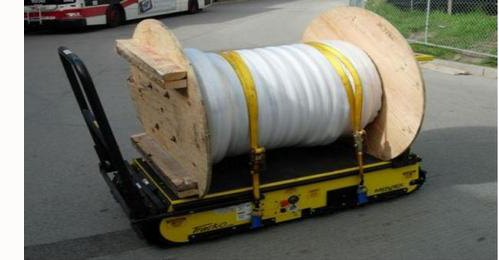 To move the strap, the motorized unit consists of an industrial motor (¾ H.P. ), an industrial gearbox (200:1) and two sets of sprockets. The motorized unit is battery powered (12 VDC). If the unit has been used in harsh conditions (sand or mud) and dust has penetrated the interior of the cabinet then a standard air jet would be sufficient to remove the dust particles. One point that needs to be noted, the motor and gearbox are all sealed therefore they will not be impacted by the harsh environment. It is worth mentioning that special attention has to be given to metal stairs with rounded edges as opposed to square edges. Although stairs with rounded edges are rare, you should make a few test runs before attempting to climb up or down these stairways with a load. The Track-O depends on friction to move. Stay alert for stairways covered with lubricants such as oil or grease, which may affect the Track-O’s performance. 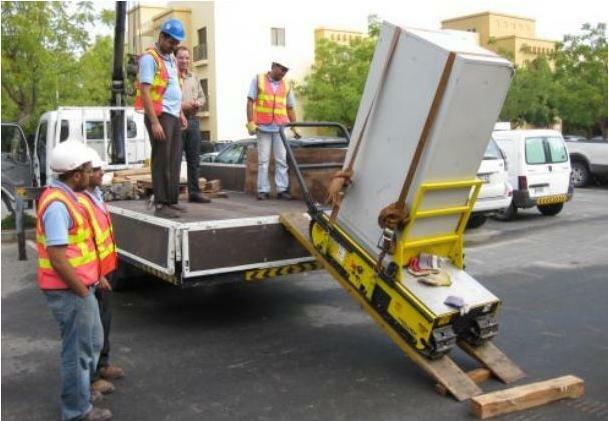 The Track-O and its load reaches the top of the stairway and attains equilibrium (when the center of gravity of the unit is near the edge of the top step), the operator can then gently push the handle up (when the unit is descending the stairways) or down (when the unit is climbing the stairways). Only light pressure is needed on the handle at this time. This simple action will ensure a smooth transition between the inclined position and the flat position or vice-versa. UL approved 40 degrees which covers more than 90% of all stairways. We recommend that you stay within this limit. There is an optional maximum inclination warning alarm (not included in standard models) that alerts the operator of an inclination of more than 40 degrees. You would still be able to operate the equipment but be aware that you are exceeding the limit and thus take the necessary safety precautions. We have decided to give you this choice knowing that should you be in a difficult position, for example if the motor stalls, major problems in removing the load from the Track-O would be eliminated. Please call us for further details on the above. The Track-O has not been UL approved beyond 40 degrees. You should not try to use the Track-O under these conditions. If you get into this precarious position involuntarily, this is what will happen: If you ordered the Track-O with the inclination warning horn option, you will hear a warning buzzer informing you that the inclination threshold has been exceeded. You will still be able to operate the Track-O. Distance yourself and all bystanders from the Track-O. Remember, next time take appropriate measures so as not to end up in this precarious position. (as a result of not being tightly secured).